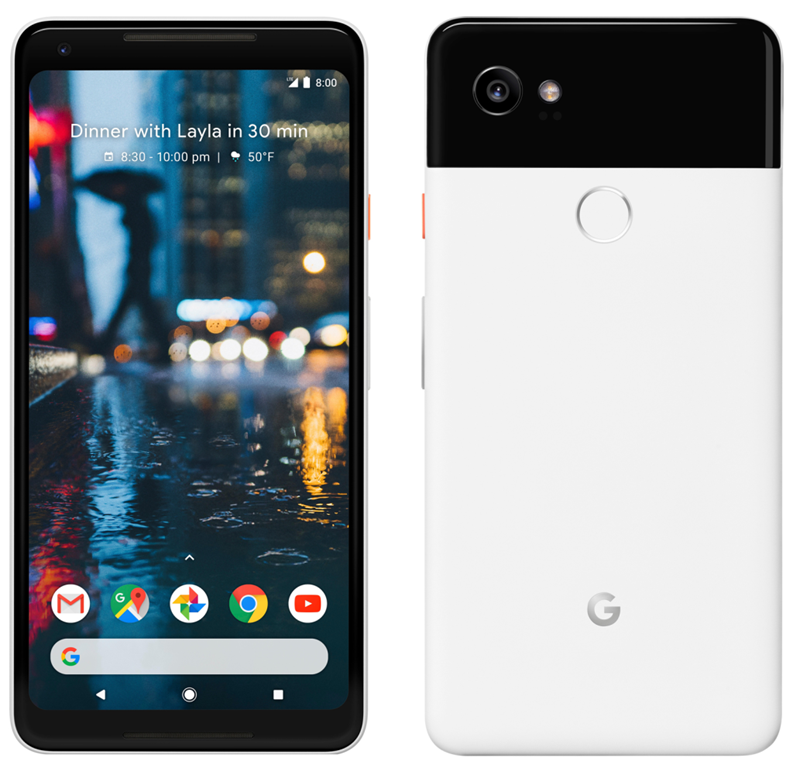 The Google Pixel 2 and Pixel 2 XL have just been launched. And here's all you need to know about the Phones. Google says that the new devices are a combination of AI, Hardware and Software working together, for delivering the best user experience. The devices are powered by a Qualcomm Snapdragon 835 processor, with 4GB of RAM. The Pixel 2 has a 5-inch OLED Full HD 1080p display, while the Pixel 2 XL 6.0-inch Quad HD OLED display and has an 18:9 aspect ratio. The screen supports always-on display, with notification icons, the clock, and music recognition to identify a song without even connecting to Google, using its on-device machine learning. The Pixel 2 has a new homescreen with live wallpapers, with a new widget displaying your calendar events at the top, while the search bar is placed below the dock. You can use the Pixel 2 to invoke the Assistant by squeezing the phone's frame,and this gesture is named as Active Edge. The Pixel 2 phones do not have a 3.5 mm headphone jack, but comes with a USB Type C adapter. The Pixel 2 device's have a single camera with a dual-pixel sensor. There is a new camera technology in the devices, called Google Lens, which allows users to point the camera to a poster or paper in real life, or on webpages, and it will extract the text you select using OCR, such as an email address. Both phones are Augmented Reality compatible for apps, games and even support AR stickers. You can use either the front or the main camera for portrait mode. The devices support EIS and OIS at the same time for videos. The phones have a metal unibody design made of aluminum, and are IP67 certified to be water resistant and support "super fast charging". The Pixel 2 is backed by a 2700 mAh battery, while the Pixel 2 XL has a 3520 mAh battery. The main camera is a 12.2 megapixels lens with an f/1.8 aperture, and 1.4µm pixel size. The selfie lens is an 8 megapixels camera. The devices have stereo front-firing speakers, and a USB Type C 3.1 gen connector, and support Wi-Di 2.4G and Bluetooth 5.0. 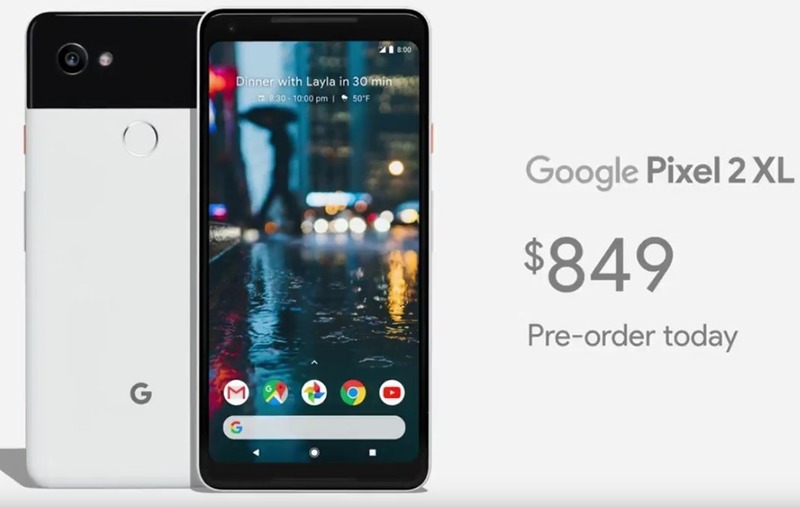 The Pixel 2 price starts at $649 (about Rs. 42240) for the 64GB version, while the Pixel 2 XL has been priced at $849 (about Rs. 55257). 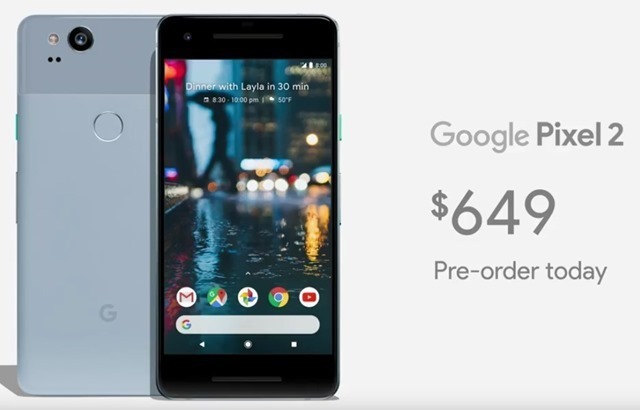 The phones will be available for pre-order in India, US, UK, Germany, Canada and Australia, followed by Italy, Singapore and Spain later this year.The Pixel 2 comes in Kinda Blue, Just Black and Clearly White. 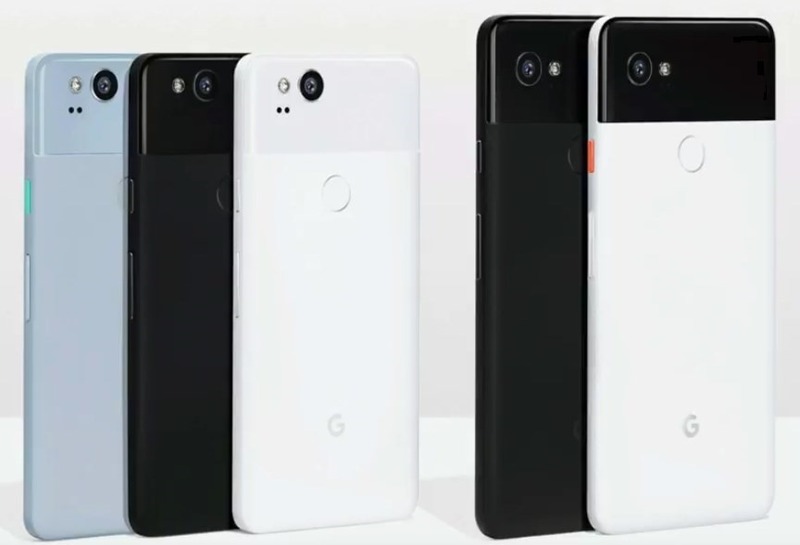 The Pixel 2 XL will be available in Just Black & Black and White colours. 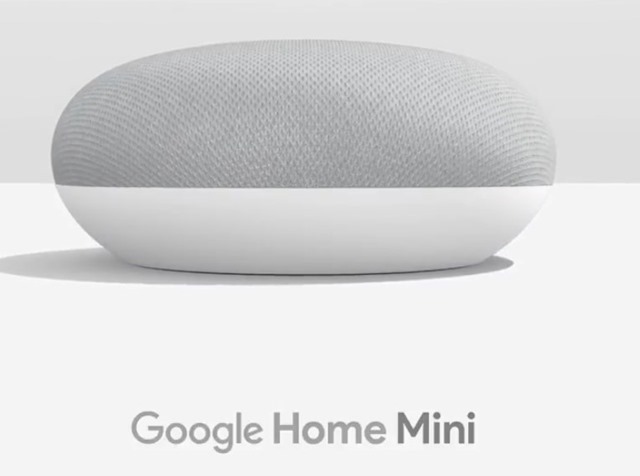 Google also announced a new version of its voice activated assistant device for homes, with the Google Home Mini. It has a fabric material with 4 lights, and can also be tapped on to control it. The Google Home Mini will be available in 3 colours: Coral, Chalk and Charcoal. The device has been priced at $49 and will be available from October 19th in Australia, Canada, France, Germany, Japan, the US and the UK. Google Pixel Book is a new laptop from the company, which runs on ChromeOS. It can be used as a tablet, which can be used in a stand mode thanks to its keyboard hinge. The device is 10mm thin, and is just 1kg in weight. It has a backlit kb, a 12.3-inch and Quad HD display with 235 PPI. The laptop is powered by Intel Core i5 and i7 processors with 16GB of RAM, and has a 512GB SSD. The device offers 10 hours of use, and has a USB C Charger port. The PixelBook now supports Google Play with all of its apps. The laptop comes with a new stylus called the PixelBook Pen, which works with Google Assistant powered search, handwriting recognition, and more. 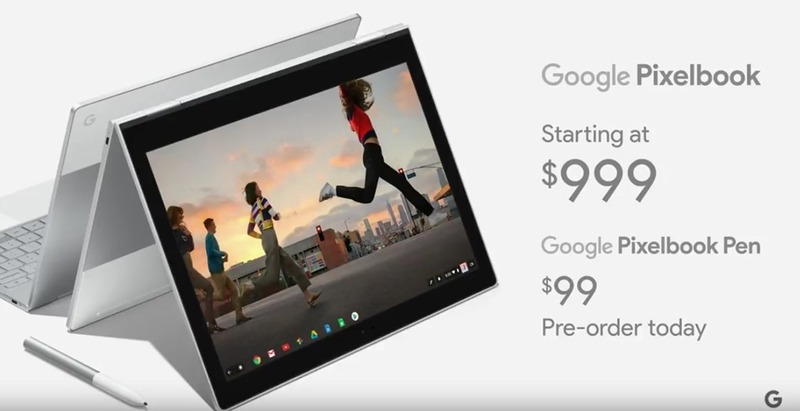 The Pixelbook starts at $999, with the Pixelbook Pen priced at $99. The device will be available in the US, Canada and the UK starting October 31st.